Warbler was taken down from a height of 55 feet by climbers accompanied by a massive show of force from California Highway Patrol (CHP), who arrived in the early morning fog with eight patrol cars, two command cars and a paddy wagon and many officers. Caltrans has been clearing brush to build a fence along the project site. You can read about the project here. Press release below. 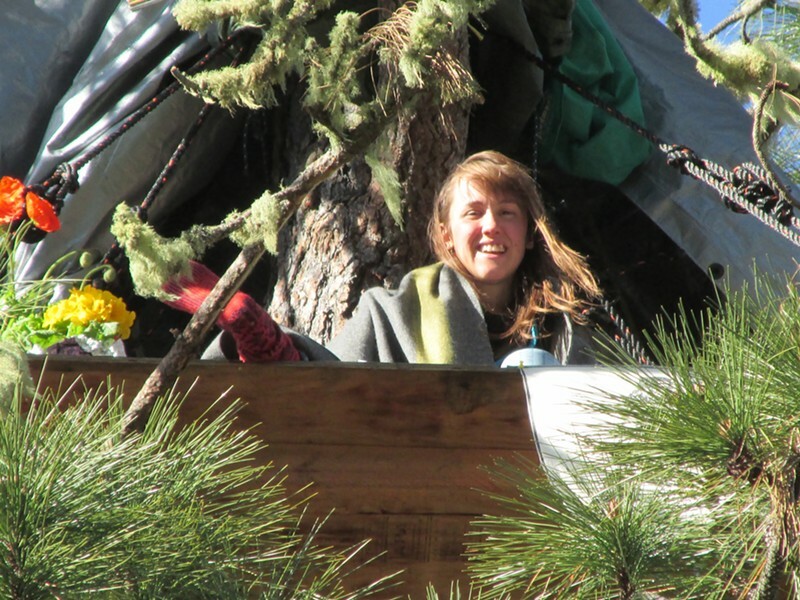 Willits, CA -- Early this morning the tree-sitter known as "Warbler" was removed from high up in the pine tree she has occupied for over two months in protest of the Caltrans Bypass in Willits in Mendocino County. Warbler was taken down from a height of 55 feet by climbers accompanied by a massive show of force from California Highway Patrol (CHP), who arrived in the early morning fog with eight patrol cars, two command cars and a paddy wagon and many officers. The scene was witnessed and reported by another tree-sitter named Falcon, in a tree across Highway 101 who had a view of the scene. Warbler has become a icon in the fast-growing campaign in opposition to the Caltrans Bypass project, slated to destroy significant wetlands and an oak woodlands where nesting migratory birds have been spotted. Warbler embarked on a protest hunger fast on March 28. Supporters of Warbler and opponents of the Caltrans project are arrived en masse on the scene in this small Northern California town. At this writing, two people have been arrested for sitting in front of vehicles; more arrests are expected. A "cherry-picker" truck has been sent to other tree-sits that have gone up in recent weeks in the Bypass path. Those extractions of sitters have not yet been verified but are in progress. Caltrans crews also cut down the large Ponderosa Pine tree Warbler has been living in after throwing her belongings to the ground. There are photos taken on site that can be made available.